Research shows that spending time in nature benefits us both physically and mentally. Just taking a walk in a forest can regulate blood pressure, boost mental health, lower the risk of illness and reduce stress. You may be surprised to learn that volunteering also has a positive effect on your mind and body. Looking for an opportunity to stretch those muscles? Conservation Volunteers (CV) events are a great way to get active. You’ll get moving as our staff lead you on a walk through local conservation sites. Learn how to tackle a variety of work projects, ranging from weed pulls to shoreline cleanups and tree plantings. Our online event descriptions outline the fitness level recommended for each volunteer activity, making it easy for you to find the right fit. Simply being outside in a natural environment has been shown to reduce levels of stress and anxiety. Participating in physical activity in a city doesn’t have the same stress-reducing abilities as being active in nature. 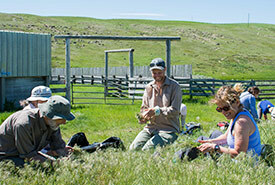 NCC’s Conservation Volunteers events are held outside, on our properties. Whether it’s a cleaning up a beach shoreline, grooming woodland trails or collecting native seeds in the grasslands, you’ll have the opportunity to relax in nature. Connecting with like-minded individuals through volunteering can reduce feelings of isolation. Attending events is an excellent way to make new friends and grow your social network. CV events are a great chance to get your hands dirty, learn restoration tips and tricks from long-time volunteers and become part of a welcoming community of nature lovers and restoration experts. Participating in hands-on conservation initiatives can help you learn new skills and, in turn, allow you to contribute your knowledge to a project. Immersing yourself in an activity that requires your time and talents can provide a sense of accomplishment and boost your self-esteem. Whether it’s honing your birding skills or learning how to remove a barbed-wire fence, you’ll walk away from our CV events feeling good about what you’ve learned and accomplished. Volunteering naturally makes you feel better, as you contribute to a cause and a community. Research has shown that happy hormones and brain activity increase when volunteering. 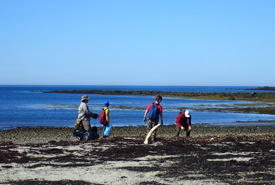 All of our volunteer events contribute to conservation action on the ground. You’ll be able to see first-hand your impact on the environment and your local community. The Nature Conservancy of Canada’s (NCC's) Conservation Volunteers program offers many opportunities to get outside and participate in hands-on conservation throughout the year. By taking part in a Conservation Volunteers event, you’ll gain health benefits while supporting important work on the ground. 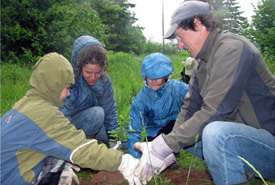 Check out our calendar of Conservation Volunteers events to find a project near you. This program has been made possible thanks to the support of Canada Life (formerly Great-West Life, London Life and Canada Life), the national sponsor of NCC’s Conservation Volunteers program.